At Cardboard Cutout Standees our goal is to have every one of our customers 100% satisfied with our custom cutouts. We have thousands of satisfied customers. Read below to see what our customers had to say about their experience with our cutouts. "I’m obsessed!! You guys rock!" "My fairy turned out great, thanks guys! I'll be using her for my Senior Exhibition at Otis College in May." "The Neighborhood Comics mascot hanging out with R2D2 at Savannah Comic Con! Thanks, Cardboardcutoutstandees!" 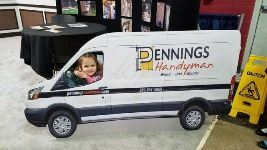 "Thank you Cardboardcutoutstandees for the awesome work van cutout! It was a big hit at the Home Show! " "Awesome job Cardboardcutoutstandees You guys did an amazing job working with us. Thank you so much for all your hard work and endless emails!" "50th wedding anniversary! Then and now!" "I must say I am OVER THE MOON with how excited I am!! Y’all did SUCH an amazing job! This was a Christmas gift to my mother and she LOVED IT!! GREAT QUALITY!! " "The kids all loved our “Meet the Tooth Fairy” cutout! Thank you for the wonderful customer service, Cardboardcutoutstandees!" "Our cutout was a huge surprise at our celebration of life party. Many people took the opportunity for one last photo." "Made this for the wedding of daughter Sarah to Troy, who is a devoted fisherman. The bubble says, " Welcome. But I would rather be fishing." The cutout was displayed at the reception and guests had fun taking their photo with it." "Thanks to cardboard cutout standees, my son could make it to his sister's wedding!!! ????" "Thanks for helping get the most important ppl to the wedding"
"Shout out to Jon! I ordered one of his cutouts for my daughter's bridal shower and it was a huge hit. It came well-wrapped and protected & in perfect condition. Timely delivery & outstanding customer service. Jon personally spoke with me several times. Highly recommend!" "Thanks to Cardboardcutoutstandees for the awesome cut out of our surfing slug! We've been using it at all of our recent events!"" "Our dad was one of the funniest guys ever. So for his funeral we ordered a six foot tall "Eddie" to greet everyone as they came into the church. Best funeral ever!!! So much laughter and everyone was getting pictures with dad. A fantastic tribute to my dad!" "Louis and Minnie W. on their 60th Wedding Anniversary in June of 1937. The visited us again in our 2016 family reunion." "Love the standup! Will be perfect for team photos for my Scavaneger Hunt business!" "My buddies and I go on an annual guys trip to Cabo every year the original guy from the start of the Cabo trips broke his leg prior to the trip and was not able to fly- So we took him with us thanks to Cardboard Cutout"
"Max goes off to college this summer, so for father's day he got Greg a cut out "Buddy" in case he gets lonely! It was a hit at the Grad party too! Thanks guys!" "He was so happy with his Standee!" "Our Standee was hit at my parent's 50th wedding anniversary." "The Cardboardcutoutstandees was amazing. Everyone enjoyed it and loved it at our Family Reunion. All the family guests enjoyed taking pictures with the standee. The details of the photograph was on point, from the pocket watch to the flowers. Thank you for such a great job and making this picture of the past of my grandparents something of the future, today. Love it"
"The newlyweds enjoying their honeymoon suite! Thanks Cardboardcutoutstandees!! They were a huge hit!" "Sending our daughter off to college with her "dog"!" "We just had the quadrennial meeting of our denomination that about 30,000 from around the world attended. We were hosting a movie about our founder's life so we ordered a cardboard cutout standee for our department's exhibit. Hundreds of people stopped to have their pictures taken with our Phineas Bresee...and he even wandered to some other exhibits (we have pictures of him with motorcyclists and balloon hat makers, too). The standee highlighted a great sense of connectedness...because the values he founded our church on 100 years ago are still priorities members of the Church of the Nazarene pursue today. In this photo he stands with the current and previous pastor of the church Bresee pastored." "Our Polish cartoon Bolek and Lolek cutouts were a huge hit at the Little Poland Festival in New Britain, Connecticut. Thank you." "Our cardboardcutoutstandees were such a hit! Ordered it for a 40th wedding anniversary using a photo from 1977 and the quality was amazing (seriously.. some companies couldn't even recreate due to the photo) but Cardboard Cutout Standees went above and beyond!" "Our fun-loving daughter just wanted to celebrate her birthday with Rizzo. Thanks for making it happen! ????" "Just wanted to let you know that the stand up was perfect. My cousin loved it! Guests were even taking pictures with it. Lol"
"We sincerely appreciate your consideration. The event has evolved from just our 50th anniversary to include our Oldest grandsons wedding. Many thanks!" "Thank you so very much!!!!!!! My parents just celebrated there 50th Anniversary. So many wonderful comments on the "Standees"
I really appreciate your fine work"
"The Richard Dearwester standee was a big hit at the Columbus Cinevent film convention . Came nice and fast through mail ." "Perfect! You are an artist!" "Thank you you're awesome you're the best have a fabulous day!!!!" "Thank you very much, I truly appreciate the kind gesture ! Looking forward to receiving the cutout for my sons graduation party !" "Well, you guys did a great job. I'll definitely drop your name if people want to know who printed the standee. Thanks again!" "Just wanted to let you know my cardboard son showed up on time this afternoon. Thanks for all your help with this and will certainly tell my friends about your company." "Thank you. I appreciate your personal touch." "Last year we ordered a cardboard standee with a speech balloon, from your company. The standee proved so useful and appealing, we’d now like to do something similar….."
"It is long overdue, but I wanted to thank you for all your help with this order. My husband was so surprised and the standee looks great in the garage. I include a pic. Would recommend this to everyone – the quality of the product is perfect for our application. Looking to working with you in the future." "Thank you. I'm really excited to get the cut out for my parent's 50th wedding anniversary party coming up in 2 weeks. I can't wait to see their reaction. This is the only picture we have since they eloped, but we love it. I will be sure to let everyone know how great your customer service has been and strongly recommend your site to others." "You are the best ! I'm laughing so hard ! This is the best formal proposal of the year ! I'll let u know how it goes!" "The cut-out of my friend's black dog Fluffy came out beautifully! She is going to love it. And the material does indeed feel very strong and it will definitely fit in her suitcase so she can get him back to Jerusalem safely. THANK YOU so much for your extra time and care. The variations in his fur and his eyes are clearly visible, it looks terrific. She lost Fluffy last month after 17 years and she is eagerly awaiting the cardboard version. Thanks!!!!" "Thank you for your help. You been extremely helpful and amazing to work with." "Just wanted to send you a quick note to say how much everyone enjoyed the cardboard cutout you and your team made for us! One of our employees couldn’t attend our office holiday party, and she is always the life of the party. So we decided to get a cardboard cutout of her so she could be there even though she couldn’t be there. Everyone took pictures with the cutout and danced with the cutout and remarked on how much it really looked like our coworker when we saw it mixed into the crowd. Thank you for your quick service!" "Having a Cardboard Cutout Standee at our son's graduation party was a blast! Guests used it for photo-ops and it was a hit with the kids. It was almost too realistic -- at least two guests started a conversation with it before realizing it wasn't a real person!" Everyone loved the life-sized wedding photo of my in-laws we had for their anniversary party. It was a great conversation starter and many people reminisced about their wedding ceremony.